More art! 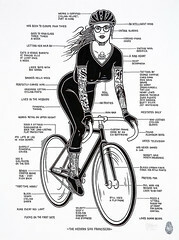 I just got this scrumptious drawing via the offices of Antonio “Bicycling Jet Setter & Art Patron” Colombo. It’s by Mike Giant. With his permission, I submit this fine work to my reader/writer’s gaze. I need say no more, he’s included plenty of text for you to chew on. ~ by jacquiephelan on January 29, 2010. This is just great! love it. Hey Jacquie what are you doing these days? hope all is well. Did you got to check my blog? I got my comics on floridaracingmagazine and 2 other ones, really happy about it.